20 | TH E M R EP O RT FEATURE A Place to Call Their Own A s a loan professional, no matter the age or demo- graphic of your client, it's vital to develop an understanding of that person's unique values. As a whole, millennials are likely to view homeownership as a signifi- cant aspect of the American Dream, according to the Zillow Housing Confidence Index. The National Association of Realtors 2016 Home Buyer and Seller Generational Trends report also found that the younger generations are working toward the goal of homeowner - ship primarily because they want a home to call their own. This generation is also very community-minded, with about 55 percent actively involved in their neighborhood or city (2016 Zillow Group Consumer Housing Trends Report). Millennials often value giving back to their commu - nities, both in their personal and professional lives. Applicable Marketing Techniques: So, what can you do to appeal to millennial values? One way is to showcase your company's community service and charitable efforts, whether it be on social media or in emails to prospective clients. Younger generations often enjoy seeing "behind the scenes" photos or videos of how your professional life aligns with your charitable giving and volunteer - ing. It not only makes you more relatable, but it also serves as a reminder that you put effort into helping others. Talking Tech A s a whole, the mortgage industry isn't known for its cutting-edge, innovative technol- ogy. The problem is, in the eyes of millennials, we need to be. The topic of technology is two- fold when it comes to marketing to millennial homebuyers. You need to be aware of how millen - nials use technology to select a mortgage lender, and you need to offer younger homebuyers the secure and effective technology solutions that they've come to expect from anyone who is doing business with them. In regards to the first topic, approximately 90 percent of millennials use the internet and 80 percent use mobile devices or apps to conduct research during the homebuying process, accord - ing to Zillow Group's report. The majority of potential homebuy- ers in this age bracket also read online agent reviews—such as those on Zillow or Trulia—before choosing a loan professional. Millennials also have high expectations when it comes to secure technology that will protect their personal information and sensitive financial data. Any tools that a mortgage lender has in place that prove their dedica - tion to information security is a huge plus. Applicable Marketing Techniques: When it comes to managing your online presence, it's best to be cautious and leave the heavy lifting to your company's market - ing and communications profes- sionals. For instance, find out if your company has a policy for responding to both positive and negative online customer reviews, so you can plan accordingly. Also, if your company offers innovative technologies such as mobile apps, make the most of those. Millennials will often seek out companies that can offer them convenient technology solutions that make the loan process more accessible. In fact, they are the generation that is most likely to fill out an online mortgage ap - plication. 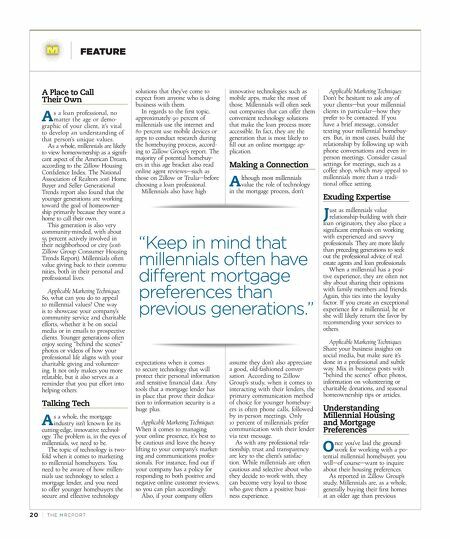 Making a Connection A lthough most millennials value the role of technology in the mortgage process, don't assume they don't also appreciate a good, old-fashioned conver- sation. According to Zillow Group's study, when it comes to interacting with their lenders, the primary communication method of choice for younger homebuy - ers is often phone calls, followed by in-person meetings. Only 10 percent of millennials prefer communication with their lender via text message. As with any professional rela - tionship, trust and transparency are key to the client's satisfac- tion. While millennials are often cautious and selective about who they decide to work with, they can become very loyal to those who gave them a positive busi - ness experience. Applicable Marketing Techniques: Don't be hesitant to ask any of your clients—but your millennial clients in particular—how they prefer to be contacted. If you have a brief message, consider texting your millennial homebuy - ers. But, in most cases, build the relationship by following up with phone conversations and even in- person meetings. Consider casual settings for meetings, such as a coffee shop, which may appeal to millennials more than a tradi - tional office setting. 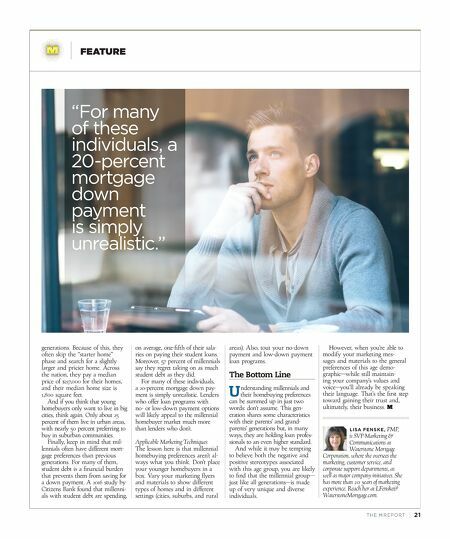 Exuding Expertise J ust as millennials value relationship-building with their loan originators, they also place a significant emphasis on working with experienced and savvy professionals. They are more likely than preceding generations to seek out the professional advice of real estate agents and loan professionals. When a millennial has a posi - tive experience, they are often not shy about sharing their opinions with family members and friends. Again, this ties into the loyalty factor. If you create an exceptional experience for a millennial, he or she will likely return the favor by recommending your services to others. Applicable Marketing Techniques: Share your business insights on social media, but make sure it's done in a professional and subtle way. Mix in business posts with "behind the scenes" office photos, information on volunteering or charitable donations, and seasonal homeownership tips or articles. Understanding Millennial Housing and Mortgage Preferences O nce you've laid the ground- work for working with a po- tential millennial homebuyer, you will—of course—want to inquire about their housing preferences. As reported in Zillow Group's study, Millennials are, as a whole, generally buying their first homes at an older age than previous "Keep in mind that millennials often have different mortgage preferences than previous generations."